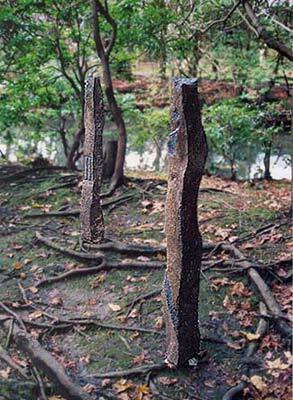 Solo exhibition at Honen-in Temple, Kyoto, Japan, December 2003. These basalt stones contain the most powerful living spirits I have ever worked with. To me they are truly spirits of the earth. I was honoured to be allowed to show these works in the garden of this famous Buddhist temple. Meeting by Moonlight, 2003 and Laughing Spirit, 2003. Basalt, 34" x 5" x 4" and 38" x 5" x 5"